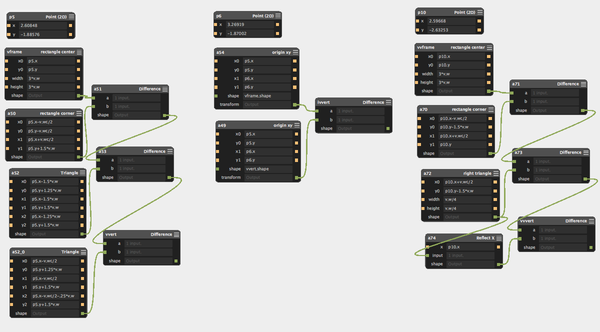 Each node is defined by a customizable script. Antimony uses Python 3.x plus a few extra magic keywords. Nodes usually represent a primitive shape or transform. Links are tracked and changes are automatically propagated downstream. The graph engine scales up to complex multi-part assembles. 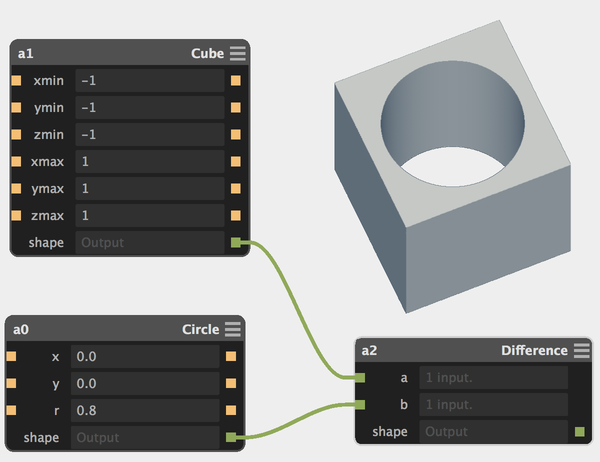 Antimony's geometry engine uses functional representations for solid modeling. 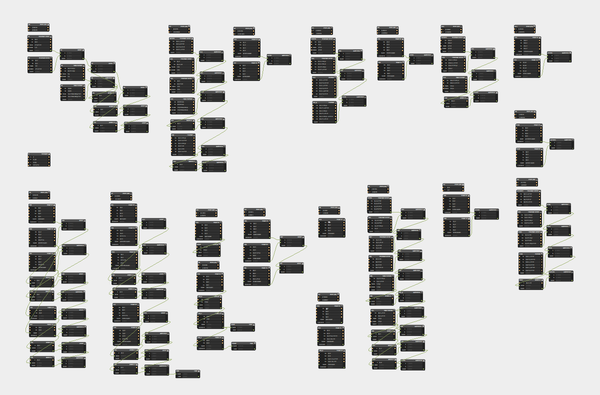 This representation is particularly suitable for modeling with boolean operations (union / intersection / difference). In the application, the geometry engine renders shapes as shaded bitmaps. They're then blitted to a 3D viewport. Antimony can export heightmaps for 2.5D processes and .stl files for 3D manufacturing. 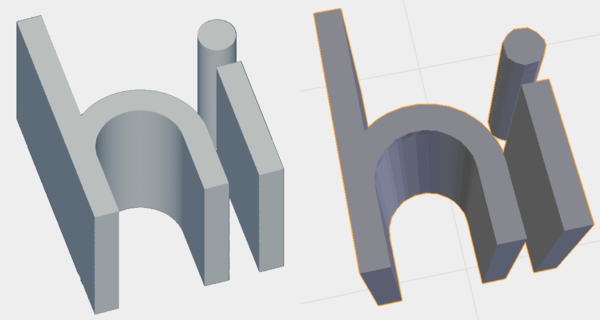 The .stl export includes feature detection to keep corners and edges sharp. Antimony's standard library defines many shapes and transforms, from basic (rotate, scale, boolean operations) to unusual (attract, repel, bend). These shapes are used in node definitions, which typically add input and output ports and can optionally define UI features. In the 3D viewport, the UI features defined at the bottom of the script are drawn over the rendering of the rectangle. These UI features are hooked back into the graph: dragging the points at the rectangle's corners pushes changes to the graph node. As an aside: most users will be satisfied with the built-in shapes, but it's also possible to define custom shapes. where x0, y0, and r are the circle's center and radius (specified when circle is called). The exact mapping from prefix strings to infix functions is left as an exercise for the reader (or can be looked up in Appendix A of my thesis). A prebuilt Mac application can be downloaded from the Github releases page. Antimony is a long-running project under active development. It's at a beta level of stability: solid, but not recommended for mission-critical use. If you're interested in contributing, there's a pretty low bar for entry. Given basic Python knowledge, you can get started making custom nodes (like this HSB color node contributed by RobotGrrl or the plethora of nodes contributed by Neil). For more ambitious folks with C++ experience, there are a whole host of improvements that could be made, from speeding up rendering to cleaning up the UI and optimizing graph evaluation. Send me a note if this piques your interest. Antimony grew out of my work on powerful personal-scale CAD/CAM workflows at the MIT Center for Bits and Atoms. It's the latest tool in a line of software that included cad_ui and kokopelli, and draws inspiration from fabserver. This update coincides with the 2015 edition of Fab Academy; use this search query to see how people are using it.